After the elimination of the English threat to the Loire valley, Jeanne pressured the Dauphin to seek his rightful throne as king of France. Two months later, amidst great pageantry, she stood beside the new king at his coronation as Charles VII in Reims Cathedral, the traditional location for crowning kings of France. Compiegne, one of the earliest royal cities in France, retains numerous large buildings that date from the 15th century or earlier. The city provides an opportunity to view original structures dating from this period. Summary: In March 1430, Jeanne left the court to help with the defense of Compiegne against attack by Philip the Good, Duke of Burgundy, an English ally. On 23 May she led a sortie against the besiegers. Jeanne became trapped and taken prisoner by the men of Count Jean II of Luxembourg when the gates closed during her force’s retreat. Charles made no attempt to rescue his heroine, mainly due to court intrigue against her by those jealous of her increasing influence. In November, she was sold by Jean to the English, as was the custom of the time for important captives. No historical figure has had as dramatic an impact in as short a time as a seventeen-year-old peasant girl from the small Lorraine village of Domrémy-la-Pucelle. No one has come from more obscure beginnings or has remained more controversial. As France’s youngest and most revered hero and as patron saint of the country, homage to her is found throughout the land. 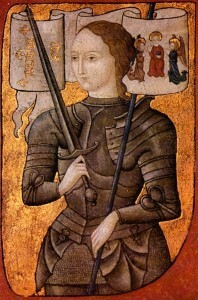 Few towns or villages do not have a rue or place ‘Jeanne d’Arc’. For a person of whom no formal portrait exists, her image is the most reproduced in France. Few personalities from this period have had their every move and utterance as well documented, translated, or analyzed. We started our series of Virtual Battlefield Tours with those of the Hundred Years War in celebration of the 600th anniversary of Jeanne’s birth in 1412 – the exact date is not known. 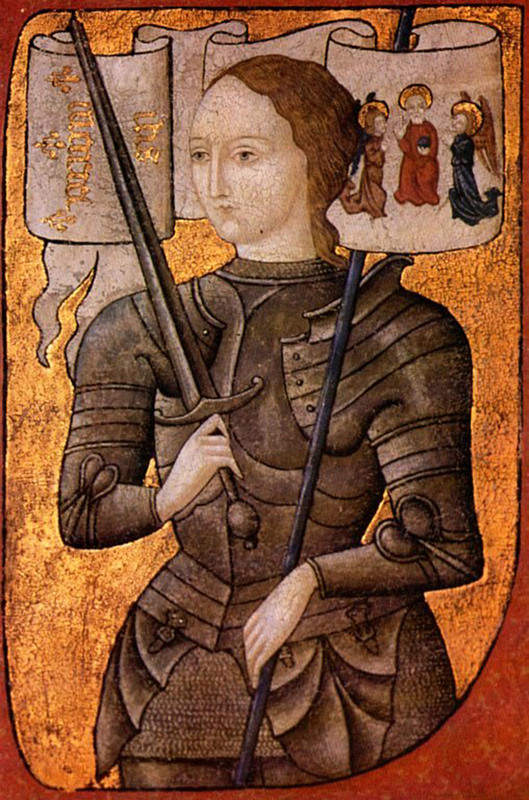 Jeanne d’Arc appeared at the court of as yet uncrowned Charles VII at Chinon begging for an opportunity to defend France from English invaders. She was determined to eliminate the English from French soil and to have the Dauphin, Charles, crowned as king of France. To her, it was a holy quest; the result of divine guidance. Her military aggressiveness revitalized French forces and leadership. Despite her untimely capture and execution, her inspiration eventually led to a French military and political victory twenty-two years later. Our signature volume, ‘Fields of War: Fifty Key Battlefields in France and Belgium’, only includes one Jeanne d’Arc battlefield, the lifting of the Siege of Orléans. Blogs, however, offer the opportunity to present additional material. Thus, we have already posted a Virtual Battlefield Tour of the Battle of Patay, where French forces including Jeanne routed the English survivors from the Siege of Orléans. Several other Jeanne locations will follow shortly. We hope that you will find them of interest.